Colorado is known for having some of the best wildflower displays in all the United States. Each summer hundreds of wildflowers bloom in a progression that starts at the lower elevations and works its way higher up the mountainsides. One of the first blooms one will see in Rocky Mountain National Park is that of the Pasque or 'Easter' flower. The Pasque Flower typically blooms in early April and takes its name from the French word for Easter which obviously coincides with the first blooms of this delicate wildflower. 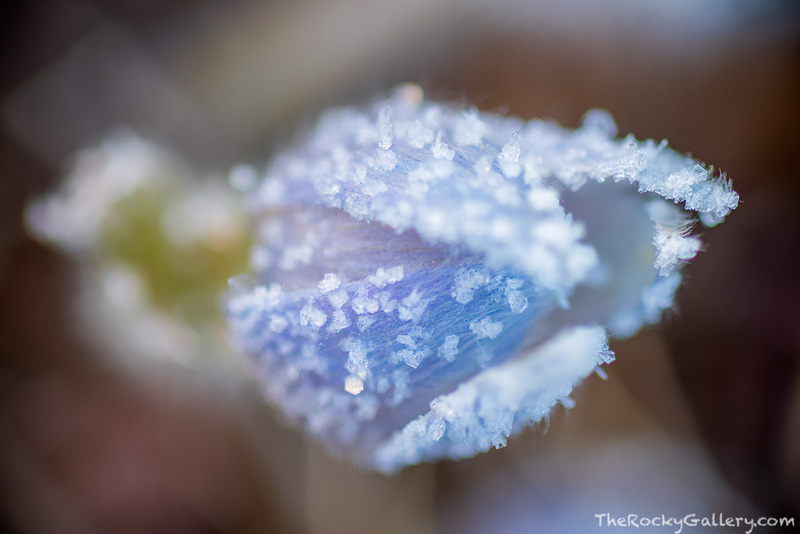 Being that Pasque Flowers bloom so early in the season they can often be burried under the snow of heavy spring storms of thick frost from a still cold night. I found this Pasque Flower blooming in Horseshoe Park one morning in April. It's beautiful petals not yet open but covered with a cystalline frost from a cold April night. Photo © copyright by Thomas Mangan.